It has been a difficult few months on the bike, with travel, work and illness keeping me off it for months. But the Summer is shaping up to be a big one. I’ve signed up for the Scody 3 Peaks Challenge next March (235km and 4500m in one day) and leading up to that I have two alpine training camps. One in less than a week based up at Bright in the heart of the Victorian Alps and the next as part of the Domestique series, organised by a group known as the Hells 500, who are well-known for their tough rides (if their name didn’t make that perfectly obvious). These camps will be challenging so I’m stepping up my training so I can make the most of them and even enjoy the rides! 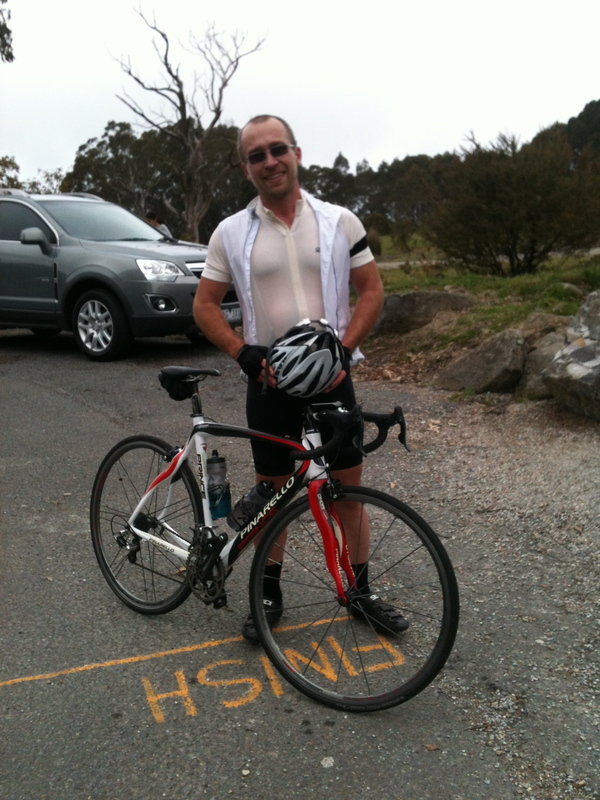 As part of my mental and physical prep I rode up Donna Buang last Sunday. It’s a big climb, given the highest rating, HC. It rises some 1060 metres over a 16km road. The only other HC climb I had done before this was Lake Mountain, which has very similar numbers. In fact, the first time I rode Lake Mountain (this February) with my mate Ben, I rode up the first 5km of Donna as well. It wasn’t planned. We’d already ridden over 150km and climbed something like 4,000m so I was well and truly exhausted. However, Little did I know at the time that I was actually close to the end of the toughest part of the climb. This weekend is the final event in the Netti Challenge Series. This time we do a ride up Mt Macedon after a loop from Gisborne to Lancefield and back, about 110km in all and 1600m. Not huge, but good for my current level. It’s beautiful country which I’ve always wanted to ride through and it’ll be fun as usual to be riding with some good friends, including guys who I’ve gotten to know on the other rides in the series. It’s bound to be a good day. As the start of the season, (serious riding season that is) it’s important to get things right from the get go. Stepping up the length and difficulty of rides can easily result in injury, especially on the following rides if I haven’t allowed for adequate recovery. So it’s about being patient and having a structured approach to build up to the main events. But it’s more than just miles. Sometimes, a small adjustment makes a massive difference. Ever since changing over my cranks a few months ago I’ve struggled more than usual on the longer rides. What has bugged me is that I’ve been struggling more than I should as I have a good base of fitness. Then last weekend a couple of my riding mates suggested that I put my seat up, and look at getting an expert fitting. So, the next day I moved my seat up a good inch and hey presto! All of the sudden I was riding big gears on long climbs without tiring out after a couple of hundred metres. In fact several times I checked because I felt like I was in an easy gear. The changes are even more subtle though. They’re about things like remembering to breath (surprisingly important), relaxing and cultivating a sense of mindfulness and flow while on the bike. In a very real way there is a powerful alignment that connects my development as a cyclist with the qualities I cultivate in my life generally. While I feel like I’m just starting out, with the right adjustments here and there I also feel I’m in a better position to realise more of my potential immediately, and then build on this in a way that is sustainable and transformative in the deepest sense. And this has effects that go well beyond improving a time on any Strava segment. It’s about building a core of inner peace and about connecting with the world around us in a creative, exuberant and magnificent way. And you thought it just about the bike. You’re right to suggest that everything we do is linked to that inner sense of self I think James. Even a bike seat adjustment!